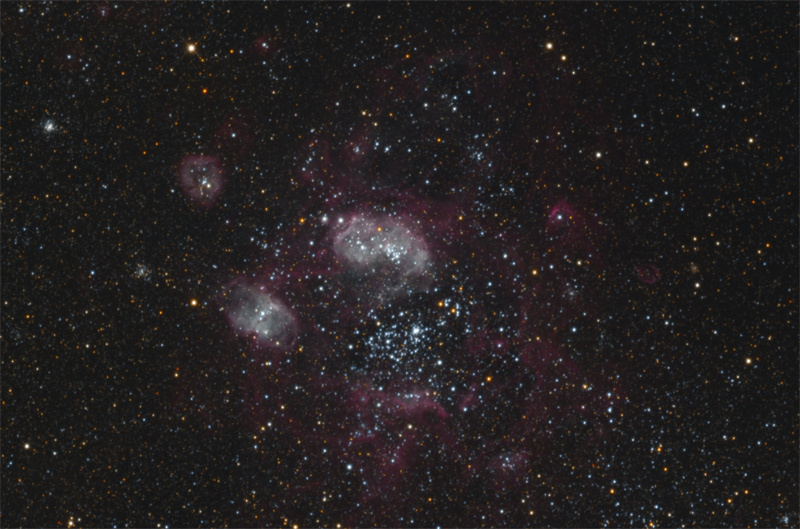 See new, spectacular, or mysterious sky images. The Lagoon and Trifid Nebulas widefield. I was very impressed with this Lagoon and Trifid widefield image by Marco Lorenzo. Specifically, I loved seeing the red "wall" of nebulosity at upper left. The picture makes it seem as if the stellar winds and general outbursts of the Trifid Nebula and M21 (a young cluster to the upper left of the Trifid) have blown a bubble-shaped area mostly clear of gas around the Trifid nebula and the M21 cluster. The blown-away gas has piled up around the edges of this huge bubble, and at upper left, the evacuated gas has probably run into another interstellar gas cloud (probably blown there by the power of M24 further to the northeast), so that the power of the collision between two huge but thin gas clouds has ionized some of the hydrogen and made it emit red light. 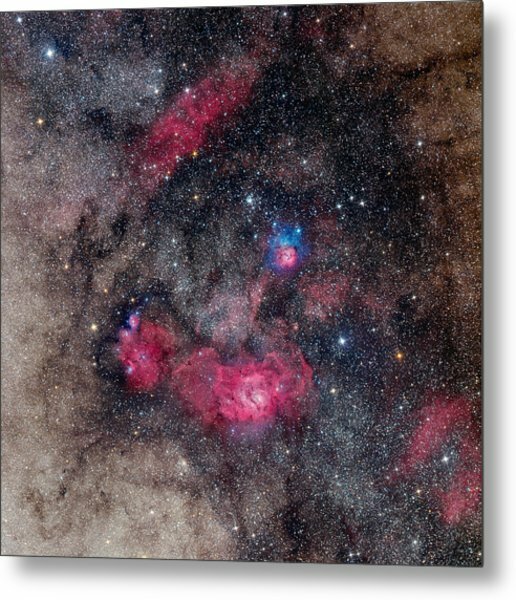 I have never seen a picture show a red nebula to the upper left (to the northeast) of the Trifid Nebula before, and I think the red nebula adds a lot of power to the image, because "new" nebula really looks like a northern counterpart to the Lagoon. It makes us see the important part that the Trifid Nebula might be playing in this part of our galaxy. I think that the red wall of nebulosity at upper left in this image looks a little bit like Barnard's Loop in Orion. The red arcs at lower right are Sharpless2-22. They surround a powerful O-type star, HD 162978. I miss Marco Lorenzi, wish that guy would come back! That is a lovely image and most of this region aren't wide enough to show that extra nebula, which is catalogued as Sh2-34. This breathtaking view of ESO’s Paranal Observatory reveals a spectacular night scene over part of ESO’s Very Large Telescope (VLT), the observatory’s most famous resident. The telescope sitting centre stage is one of the VLT’s four Unit Telescopes (UT). The VLT comprises both these UTs and four additional, movable, Auxiliary Telescopes (ATs). However impressive the VLT may be, the closed telescope is trumped in this image by the skies overhead — most prominently by the colourful plane of our home galaxy, the Milky Way, as it arches across the frame and creates a celestial rainbow. 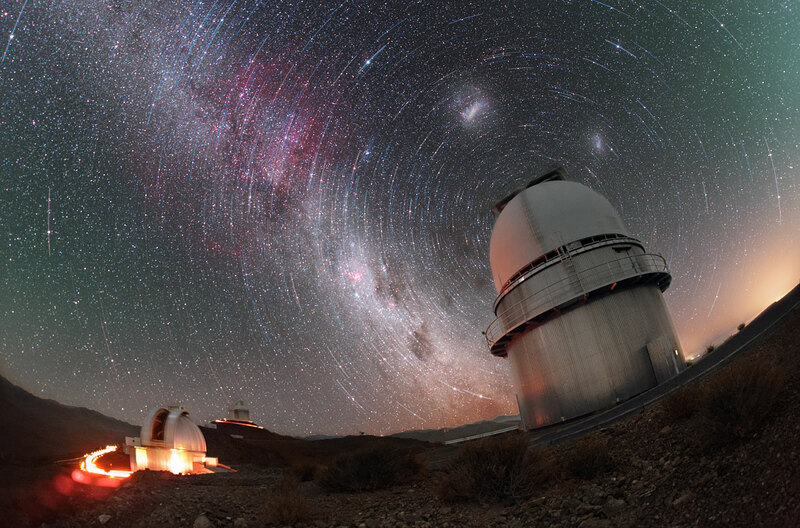 Part of the sky is tinted a faint green colour due to a phenomenon known as airglow, and the two smudges of the Magellanic Clouds can be seen to the left of the UT. The famous constellation of Orion (The Hunter) is visible to the right of centre, the bright stars of which can be used to find the stars comprising other constellations and asterisms. Drawing an imaginary line down through Orion’s Belt reveals the red star Aldebaran, part of the constellation of Taurus (The Bull). Further along this imaginary line, down towards the horizon, the Pleiades star cluster — important in many cultures and civilisations — can be seen. Above Orion are the three bright stars making up the Winter Triangle asterism: Sirius, Betelgeuse and Procyon. This intriguing image from the NASA/ESA Hubble Space Telescope shows a massive galaxy cluster called PSZ2 G138.61-10.84, about six billion light-years away. Galaxies are not randomly distributed in space, but rather aggregated in groups, clusters and superclusters. The latter span over hundreds of millions of light-years and contain billions of galaxies. Our own galaxy, for example, is part of the Local Group, which in turn is part of the giant Laniakea Supercluster. 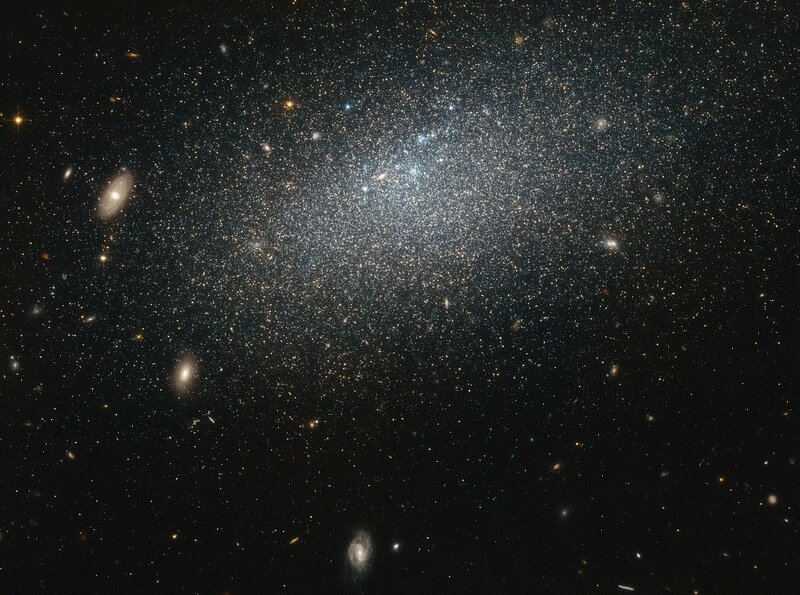 It was thanks to Hubble that we were able to study massive galactic superstructures such as the Hercules-Corona Borealis Great Wall; a giant galaxy cluster that contains billions of galaxies and extends 10 billion light-years across — making it the biggest known structure in the Universe. 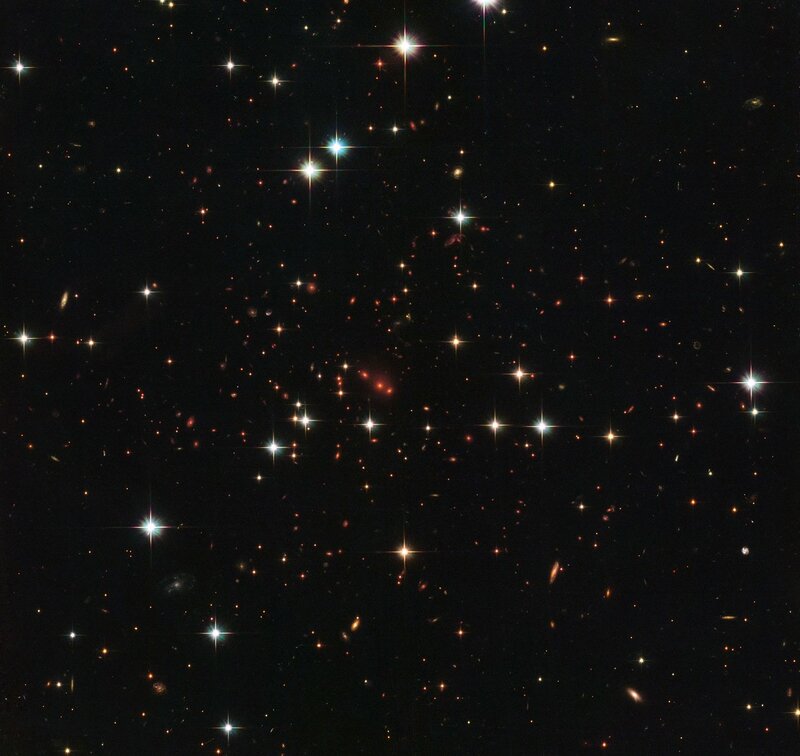 This image was taken by Hubble’s Advanced Camera for Surveys (ACS) and Wide-Field Camera 3 (WFC3) as part of an observing programme called RELICS (Reionization Lensing Cluster Survey). RELICS imaged 41 massive galaxy clusters with the aim of finding the brightest distant galaxies for the forthcoming NASA/ESA/CSA James Webb Space Telescope (JWST) to study. 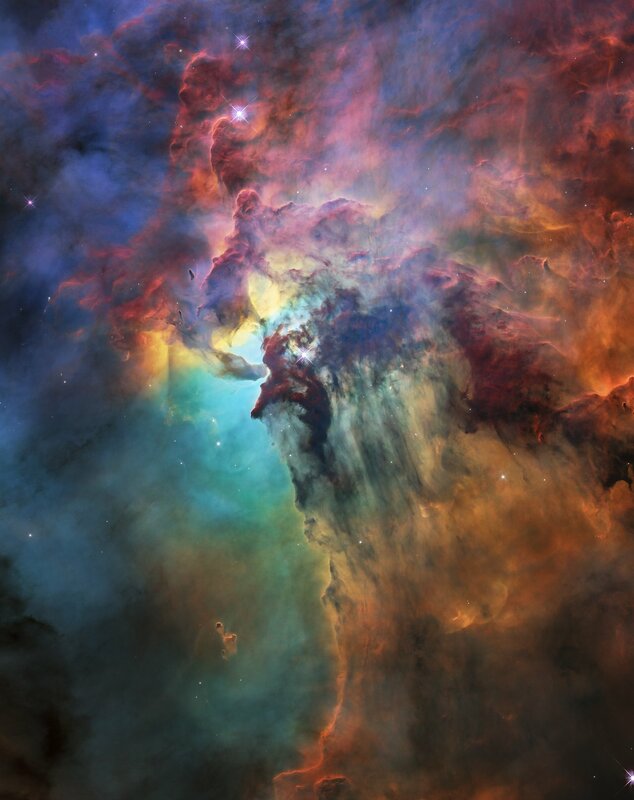 For 28 years, NASA’s Hubble Space Telescope has been delivering breathtaking views of the universe. Although the telescope has made more than 1.5 million observations of over 40,000 space objects, it is still uncovering stunning celestial gems. The latest offering is this image of the Lagoon Nebula to celebrate the telescope’s anniversary. 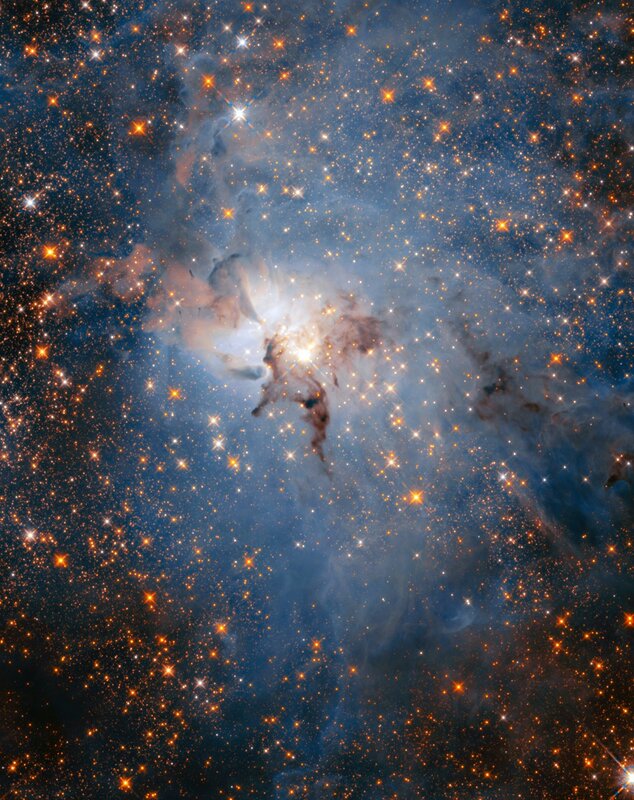 Hubble shows this vast stellar nursery in stunning unprecedented detail. At the center of the photo, a monster young star 200,000 times brighter than our Sun is blasting powerful ultraviolet radiation and hurricane-like stellar winds, carving out a fantasy landscape of ridges, cavities, and mountains of gas and dust. This region epitomizes a typical, raucous stellar nursery full of birth and destruction. I've always thought that the Hubble closeup of the Hourglass nebula in the middle of the Lagoon looks downright weird, almost unreal. What bothers me is the fact that there is this very massive and very young star in the middle of it. This kind of star should blow a terrific wind and have various outbursts. Therefore, the nebula surrounding it should be chaotic. Well, that is what common sense tells me, and we all know that common sense is the best guide when you want to understand cosmic phenomena - right? Well, here's what I find hard to understand. Large parts of the nebula do look chaotic. But the dust lanes that form the hourglass shape are insanely "regular"-looking, almost appearing solid. The weirdest-looking part of this area, if you ask me, is a twisting dust "tube" that looks perfectly undisturbed and calm, like a seal swimming in water. I refer to the dust tube that forms the bottom of the hourglass shape. How can this dust lane be twisting yet not be torn apart, as if it was a solid object? Why is the border between this dust structure and the background so sharp, again making the dust lane look like a physically solid object? Even though it is located so close to the raging power of a very massive and very young star? Is it caused by a combination of a fierce stellar wind twisting it and strong magnetic forces somehow keeping the dust tube together? 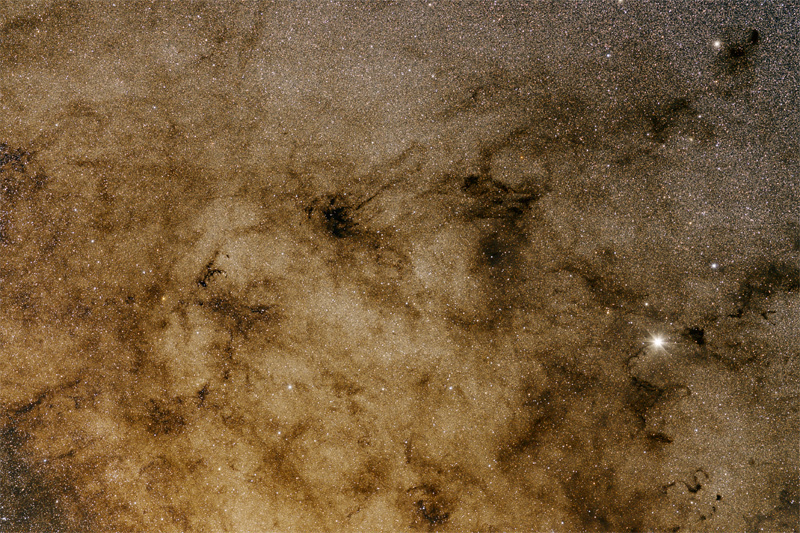 This is what the largest available image of the Milky Way using only off-the-shelf photographic equipment looks like. The Canary Islands, a Spanish enclave off the coast of North Africa, are famous as a favorite vacationing spot for Sun-deprived northern Europeans. But they’re also a prime location for astronomy, hosting two observatories on mountaintops that benefit from exceptionally clear and dark skies. Taking advantage of such a privileged environment, a small team of two astrophotographers and a professional astronomer have embarked on a project to produce a massive image of the Milky Way using only off-the-shelf photographic equipment. Go to the Sky & Telescope page for a larger picture. 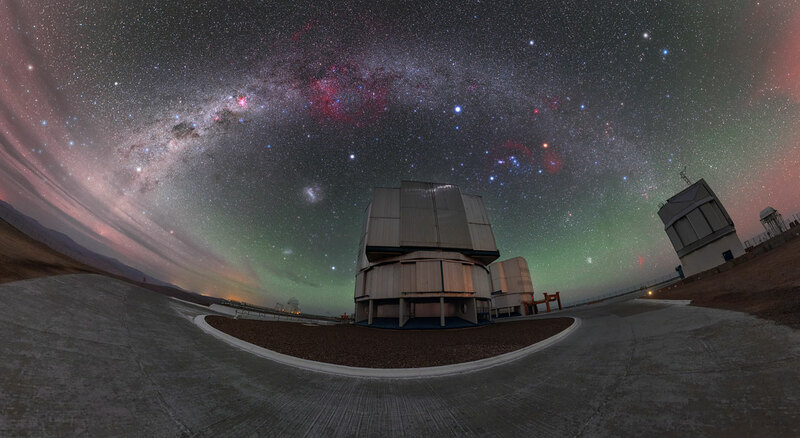 This unusual image shows three of the telescopes sited at ESO’s La Silla Observatory in Chile — the MPG/ESO 2.2-metre telescope on the left, ESO’s 3.6-metre telescope sitting in the distance behind it, and the Danish 1.54-metre telescope on the right, apparently looming over its companions in the foreground. The star trails shown here are centred on a point in the sky known as the south celestial pole, which here hides behind the dome of the Danish 1.54-metre telescope. The celestial pole is a point on the sky aligned with the rotational axis of our planet. These trails were actually captured in a separate image which was then combined with the image of the telescopes, adding a rather disconcerting spinning sensation to the resulting composite. The image also highlights the majesty of the Milky Way as it snakes across the sky, accompanied by the Large and Small Magellanic Clouds (the two bright smudges). 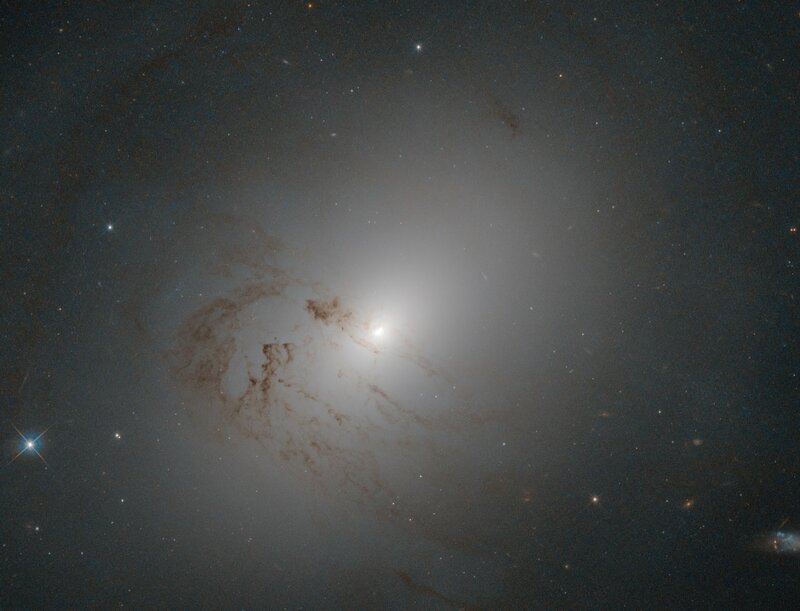 This pretty, cloud-like object may not look much like a galaxy — it lacks the well-defined arms of a spiral galaxy, or the reddish bulge of an elliptical — but it is in fact something known as a lenticular galaxy. Lenticular galaxies sit somewhere between the spiral and elliptical types; they are disc-shaped, like spirals, but they no longer form large numbers of new stars and thus contain only ageing populations of stars, like ellipticals. NGC 2655’s core is extremely luminous, resulting in its additional classification as a Seyfert galaxy: a type of active galaxy with strong and characteristic emission lines. This luminosity is thought to be produced as matter is dragged onto the accretion disc of a supermassive black hole sitting at the centre of NGC 2655. 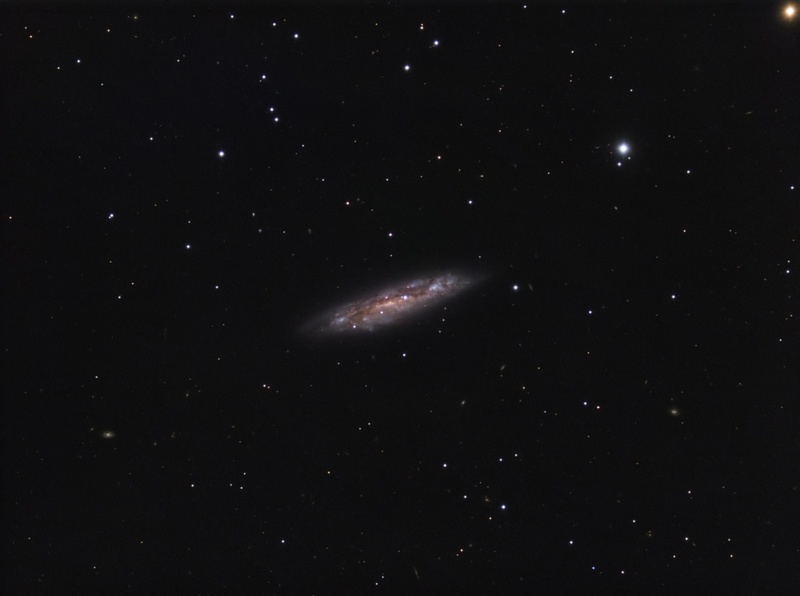 The structure of NGC 2655’s outer disc, on the other hand, appears calmer, but it is oddly-shaped. The complex dynamics of the gas in the galaxy suggest that it may have had a turbulent past, including mergers and interactions with other galaxies. NGC 2655 is located about 80 million light-years from Earth in the constellation of Camelopardalis (The Giraffe). Camelopardalis contains many other interesting deep-sky objects, including the open cluster NGC 1502, the elegant Kemble’s Cascade asterism, and the starburst galaxy NGC 2146. I'd like to post an image of the gravitational lens in the Abell 2218 cluster. Gravitational lensing has fascinated me for a long time and I wanted to take a picture of it. I used a 300mm Newton telescope with a TS 2½" Wynne corrector, and a QSI660 camera with Astrodon LRGB Tru-Balance filters. The native image resolution is 0.84 ArcSec/pixel. The image is processed in pixinsight using the Drizzle algorithm and then resampled 2x2 to a final resolution of 0.21ArcSec/pix. It covers 4.5x3.2 ArcMin of the sky. The idea of the image was to show the colors of the deep galaxies. I live in Denmark, almost at sea level (17m), so in order to get the necessary resolution I only used subs with a FWHM under 2.5 ArcSec, and for the Luminance component only FWHM under 2" were used. The object is highest in the sky from may through July, where we have no nights, only astronomical dusk, in June actually only nautical dusk. Over three years I collected some 65 hours of useful data that went into the attached image. During the process I discovered that my main mirror had a slightly turned edge, and replaced it, so the luminance data are derived from two different mirrors.